Tina Zysk traded in a life of business proposals for one of marriage proposals when she launched Grace + Ivory, a D.C.-based made-to-measure wedding dress company. WASHINGTON — On April 7 and 8, the art-adorned walls inside D.C.’s all-female co-working space BUREAU will be covered in lace, tulle and satin. Mimosas and makeup will replace the usual site of lattes and laptops — and it’s all for a free weekend-long bridal pop-up, featuring the collection of the D.C.-based made-to-measure wedding dress company, Grace + Ivory. Last year, Tina Zysk traded in a life of business proposals for one of marriage proposals when she launched Grace + Ivory. The former international development professional saw a gap in the booming bridal industry: a lack of dresses that are customizable to varying figures, tastes and budgets. “There’s tons of dress styles out there and they’re all beautiful, but I felt like the (wedding dress purchasing experience) was stuck in a certain structure,” said Zysk, 31. This structure typically entails ordering a close-to-size dress from a store — sometimes up to 12 months in advance — and then paying additional prices for alterations before the big day. Online-based Grace + Ivory offers a different experience. Dresses in the 30-piece collection are made specifically to each bride’s measurements and are ready in about four to six months. In most cases, they’re also customizable if a bride wants a shorter train, an altered neckline, or a different color. Prices for the gowns hover between $700 and $1,700, and a portion of the company’s proceeds goes to programs that help women and girls in need, like Plan International’s “Because I am a Girl” campaign. Zysk — who is based in D.C., but bounces between the District and Beijing, where her husband works — is able to offer a custom experience at an attractive price point by cutting out the middlemen in the process. She works directly with a supplier who sources fabrics from around the globe, and with a Beijing-based designer and dressmaker, who also made Zysk’s wedding reception dress. 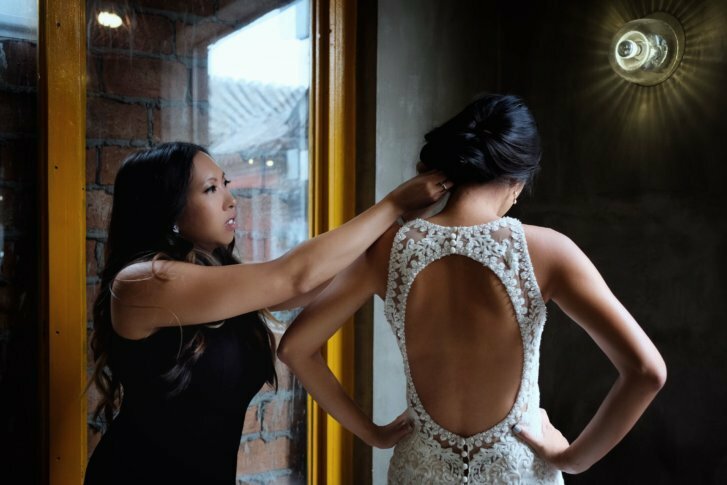 “It turned out that she was interested in working with someone who could bring this type of experience to brides outside of China,” said Zysk, who emphasized that all of Grace + Ivory’s dress details are hand-beaded and hand-sewn. Interested brides can schedule a free design consultation with Grace + Ivory to walk through the measurement, customization and ordering process. Zysk will also be on-hand to answer questions and take personal appointments at the two-day BUREAU pop-up. Other wedding vendors, including local makeup artists, hair stylists and floral designers will also be in attendance. The Grace + Ivory pop-up event at BUREAU, co-hosted by Taylor and Hov Event Design, is free and open to the public from 10 a.m. to 3 p.m. both Saturday and Sunday.